The Creative Arts Building will take a step forward, in rhythm, beginning with the spring semester. Room 102 has been renovated from a thrust stage for theatre into a full-time rehearsal space, studio and classroom for the School of Theatre & Dance. The studio will be used for modern and postmodern (barefoot) dance instruction and some jazz as well as a rehearsal space for musical theatre and plays. It will also serve as a flexible performance space for dance showings and, in the spring, the annual Beijing Opera workshop. The 3,800-square-foot studio’s features include mirrors, retractable seating, a sound system, an upright piano, flat-screen monitor, lighting and dedicated ventilation as well as marley and sprung floors to help prevent injury and strain. Ten course sections are scheduled in the space for the spring semester. 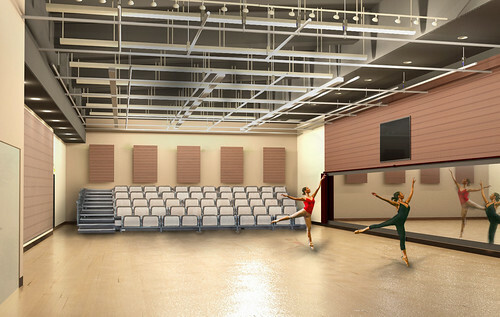 The new space, the former Studio Theatre, is one of two dance classrooms in the recently reconfigured School of Theatre & Dance. It replaces the dance studio in Fine Arts 203, which is being converted into the Museum Studies Program’s new Global Museum. These changes are part of a major space management project involving numerous academic departments and six campus buildings. Once completed, the project will free up about 17,000 square feet of classrooms and offices for other uses by the University.